Legend has it that Aphrodite’s Hearts will bring a current love closer to you, or if you are currently alone will steer the person of your dreams to your doorstep. 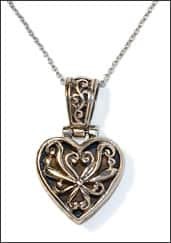 If either of the above is your wish, let this Aphrodite’s Hearts Amulet bring you true romance, unconditional love, and the fulfillment of your dreams. Wear or carry this legendary piece bearing the name of Aphrodite, Greek Goddess of love, beauty and pleasure, and you may feel its gravitational pull on anyone who comes into view. 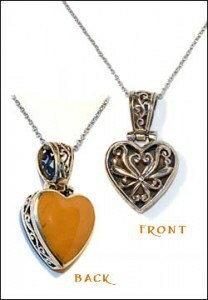 Aphrodite’s Hearts is designed to capture the heart of the one you love. Let the power of Aphrodite’s Hearts guide the one you love into your arms. Turnaround a seemingly hopeless relationship. Turns a hard heart into a soft, loving heart. Double the love and TLC you deserve. Thank you thank you… I ordered the tthe Aphrodite’s heart and I will tell you it is AMAZING!!!! My spell was cast on March 9, 2009 and on March 12th my boyfriend told me I was the girl he wanted to spend the rest of his life with. I wear my Aphrodite’s heart every where, never take it off… THANK YOU THANK YOU THANK YOU! I purchased this beautiful necklace about 9 years ago and it has helped me spiritually since day one. Today, 9/26/14, I was waiting in line and a person commented on the pendant. She asked where I got it and it made me so happy to be able to tell her where it came from. I am happy to say I love getting compliments on this necklace. Thank you!